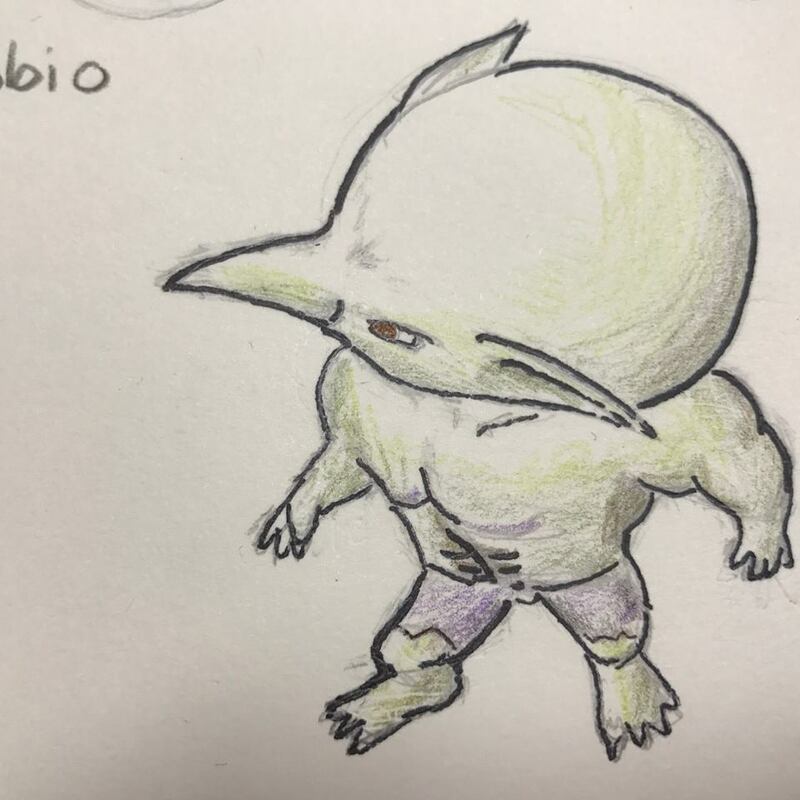 It's the Gainz Goblin. I'm hitting the gym these days and this word, and this idea, came into my head. It's relevant, though - bear with me. I'm really enthusiastic about the other project I've been working on - Geggle Makes a Potion - to give it a working title. I really want it to be a stand-out piece of work I can be proud of. However, I mustn't allow my own enthusiasm to get the better of me. I mustn't let it become a Gainz Goblin and leave me with an empty shell of a cartoon. "The thing you are going to build on must be basic... It's the thorough understanding of the basics that produces real sophistication." That's a quote from Richard Williams' Animator's Survival Kit (p.46). And that's what I need to do. I need to prove I can do the basic things before I continue. I don't see any other way to continue with the project. I need to make some basic things, walk cycles, picking things up, etc, so I know I can do them when presented with such things in a story. Anyway, this means I can get going and animate some stuff! 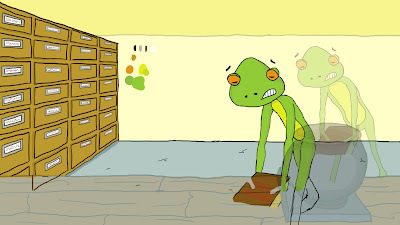 A picture I drew sitting in a cafe - the same frog fellow, Geggle, marvelling at a fireball he made. Normally, cartoon characters aren't that competent and he's likely to burn himself in a moment. I've been working on something 2D for the past few months. It took a while to get anywhere that I'd feel comfortable showing as progress - lots of time designing the character, thinking of stories (but at least I have an idea for another episode with this guy! ), and making storyboards, but I finally made the dive and started drawing on the computer. I'm really happy with drawing digitally at the moment. It's been easier than I remember getting used to the tablet, and sketching things out, erasing, fiddling with the brush thickness settings, the things I was worried about, are actually quite straight forward. This is the second frame I've drawn. I'm beginning to see how 2D animation is said to be a very slow process. I suppose it doesn't have to be, but the temptation to erase and adjust and redraw, and add more detail, sure slows things down. Now I wonder how long a professional animator is given to draw each frame or clip when they work for a studio. Perspective is becoming the biggest challenge for me at the moment - getting the feet in the right place, getting the position of the shoulders and hips right. It's easy enough to draw a set of hips and shoulders when the positioning doesn't matter, but when animating, the positioning must be very precise to show the right movement. We'll just have to see how well I can do. I hope next time I can show some movement! It's finished! Well, I'm ready to move on to the next project. Like anyone else creative, I could easily spend the next decade making tweaks, but then I'd only have this. I learned quite a lot. There's a huge value in getting the key poses down properly. Make them as striking as you can, and then make them twice as striking, and then a little more. Also, the principles of squash and stretch, and follow through, are so powerful. The extra whipping of the character's fingers really transforms the piece. It becomes more compelling. I learned a lot about secondary action, but this is something else. Meta-action? The action of the actions. I'm excited to use what I've learned in the next project.